To Sum It Up: A chance encounter on board the spaceliner the Icarus puts military hero Tarver Merendsen in the path of Lilac LaRoux, the daughter of the ship’s builder and a man with wealth that Tarver can only dream of. Lilac, so accustomed to people trying to use her as a means to get to her father, makes it blatantly clear to Tarver that she wants nothing to do with someone like him. That’s unavoidable, however, when disaster strikes the Icarus and Tarver and Lilac’s escape pod crash lands on a planet with no apparent signs of other humans. Stranded for what may very well be the rest of their lives, Tarver and Lilac are forced to work together in order to survive on a planet where no one else seems to have been able to do so. Review: Count These Broken Stars among the numerous books I decided to read because I’d seen it everywhere. I can’t help the curiosity that accompanies much buzzed about titles, and sometimes they work out. Sometimes they don’t, though, and I’m sorry to say that These Broken Stars falls into this category. I feel like this book took forever to read. It would seem like I’d read a good number of pages, but when I checked, I’d discover that I hadn’t gotten very far at all. I kept waiting for the magic that had enthralled so many readers to kick in, but alas, I couldn’t find it. 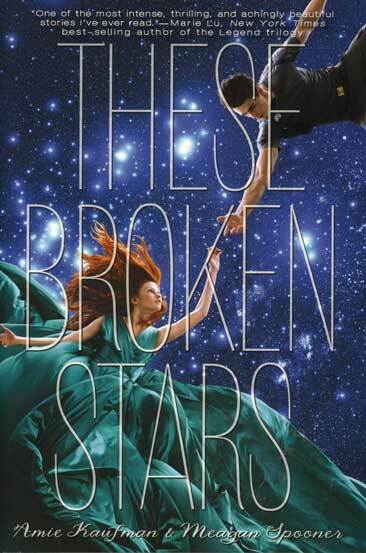 These Broken Stars is told from the perspectives of its two main characters, Tarver and Lilac. He’s from humble roots and made a name for himself as a war hero; she’s known everywhere thanks to her incredibly rich and powerful father. So we have a guy and a girl from polar social classes who are passengers on a spaceship headed for catastrophe. I would have been all right with the very familiar ring of this story if only the book had not employed other tropes as well. First Tarver and Lilac barely tolerate each other, then they gradually warm up to each other, being the only two people on the planet and all. Normally I love slow-building relationships, but like so many other aspects of the novel, this one felt too formulaic. Just about everything that could have happened to characters in this disaster scenario happened to our two protagonists here and without really making me feel that their experience was unique. Finding an investment in Tarver and Lilac as characters was also a struggle. There’s a lot of, “Someone like him/her doesn’t go for someone like me” and, “I wouldn’t be alive without you” followed by, “No, I wouldn’t be alive without you.” I will give Lilac credit for growing up significantly by the end of the book, though I wasn’t as enthusiastic about how she kept mentioning that her father would be apoplectic to find her with a commoner like Tarver. Tarver’s chapters echoed Lilac’s frequent thoughts about the class difference between them, and I became rather weary of hearing it from both of them. The most attention grabbing element of this book for me was figuring out what was going on with the planet that Tarver and Lilac found themselves on. The mystery is subtle at first and builds at a nice pace as the novel moves along. The promise of learning about the planet’s secrets is what motivated me to hang in there with These Broken Stars; otherwise, seeing it through to the end would have been even more challenging. Because the book is so focused on two characters and they didn’t stand out much for me, I never really got into this book. Plenty of other readers loved it immensely, however, so I encourage you to check it out for yourself. All in All: I feel like I jumped too hastily on the hype train with this one, and I really can’t picture myself going on with the series. I totally missed something with this one because I just couldn't find what everybody else saw in it. The planet was the most interesting bit for me; I thought the mystery was very well plotted. I just wish that everything else about the book had been on that level.